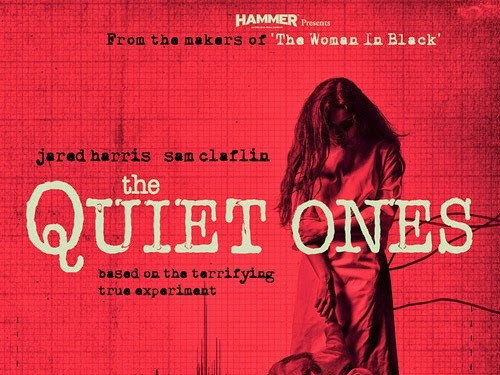 My mother told me to watch out for “The Quiet Ones,” so I figured I should see the movie. Now I am scared to turn out the lights. Happy Mother’s Day, Mom. Jane Harper (Olivia Cooke from the “Bates Motel” TV series) has been troubled since she was a small child. She was moved through many foster homes because “something happened” that could not be explained. Eventually she ended up in an asylum until 1974 when Professor Coupland (Jared Harris from “Lincoln”) took custody of the young woman. Coupland thinks he can save her and prove her condition is more than abnormal psychology. He begins “the experiment” to prove there is a link between mental illness and supernatural phenomena. He suckers – I mean – hires young camera geek Brian (Sam Claflin from “Snow White and the Huntsman”) to document the process so there is proof of what is happening. There are two other students helping the professor, but it is Brian who is quite taken with Jane. He does not listen when the professor tells him, for his own safety, “do not look in her eyes.” I made the same mistake when I was his age, and now we have two kids and three grandchildren. The movie had a slow build that allowed you to get to know the players and the game. Director John Pogue (“Quarantine 2: The Terminal”) excels at the art of filming a guy who is filming something. They use most of the old scare tactics, but there is a nice mix of character and story that sustains the drama. This is loosely based on a true events, but then aren’t most horror movies? My third grade teacher was a Gargoyle Queen. The performance of the leads made this movie bearable. Olivia Cooke managed to be crazy and scary and dangerous and sympathetic all at the same time. I also enjoyed seeing the usually smug Brit Jared Harris come unglued. The ending surprised me, which it is supposed to do. I just hope they don’t do a squeakquel. This was more like a scary drama than a horror movie, and that is a good thing. So, I give “The Quiet Ones” 3 stars out of 5, and I am glad that I always listened to my mother.